Dozens of people slid through slimy mud and ice cold water in a race from one bank of a river to the other. 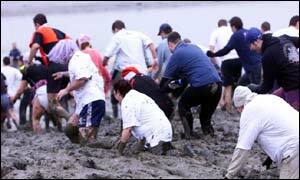 The annual Maldon Mud Race, in Maldon, Essex, attracted 150 entrants and thousands of spectators on Sunday. The race, which started in 1973, is set on the River Blackwater in the historic town. Competitors set off from one bank and wade to the other side - they then negotiate 200 metres of deep, sticky mud along one side of the bank before returning to the start. The origin of the race was from a dare made to a regular of a local pub to serve a meal on the riverbank dressed in a tuxedo. It then developed into a dash across the river to drink a pint of beer and return. The alcoholic element has been removed from the race, but there are still one or two peculiar requirements for competitors. One states that the competitors' footwear must be taped to their feet. The charity event is organised by the Rotary and Lions clubs of the town and Maldon District Council. Prizes were awarded to the first man to finish, first women, best fancy dress and last person to complete the race. The overall winner was 29-year-old Richard Jones, from Terling, Essex. He said: "The hardest part was going through the water because the current was so strong." Police constable Allan Barley, 55, from Wickford, Essex, dressed in his police shirt and hat and carried a truncheon for the race. He said: "The important thing is not to stop or you sink in the mud." Bill Geller, secretary of Maldon Rotary Club, said: "It is a huge challenge and a good laugh. "It's a good Christmas time event because there is nothing else going on this time of year."